If you’re tired of the same old accompaniments for your summer berries, try this sabayon. It is an Italian dessert that slightly custardy and very light. It goes well with a variety of fresh fruits or can be served on the side of cake. One of my favorite things to make is risotto. I love it for its versatility and simple preparation. The basic formula for risotto is pretty simple, all you need rice, an onion, white wine, cooking stock and Parmesan cheese. This creates a nice and agreeable canvas to put any imaginable combination of ingredients into. Risotto may seem intimidating if you’ve never made it before, but once you resolve to be invested in the constant stirring that is required, you will see how nicely the effort pays off. Well-cooked risotto should be slightly creamy, and slightly al dente. The constant stirring allows the starch in the rice to be released, and that is what contributes to the creamy texture of the finished dish, so do not underestimate the importance of this part of the process. Now when I talk about stirring, I don’t mean just standing there and swirling the contents of the pot around – I mean aggressive, arm-toning stirring. With an abundance of asparagus this time of year, using it in risotto is a great way to enhance this basic recipe! Welp, in typical Chicago fashion, Mother Nature has dumped a few more inches of snow across the city even though it’s technically Spring. Never fails, there’s always one last wintry slap in the face, and today is as good a day as any. While Mother Nature is dealing with her personality disorder, you can bring a little Spring into your kitchen with this dish. I wasn’t totally sure how I’d make this vegetarian friendly without just serving up a plate of the mash and saying “bon appetit”. Looking around the kitchen, I spotted some potatoes on the counter and decided I would make “scalloped” potatoes for Terry. I cut them down to what a decent sized scallop would be, parboiled, then pan seared them to get the browned edges and finished them off in the oven. 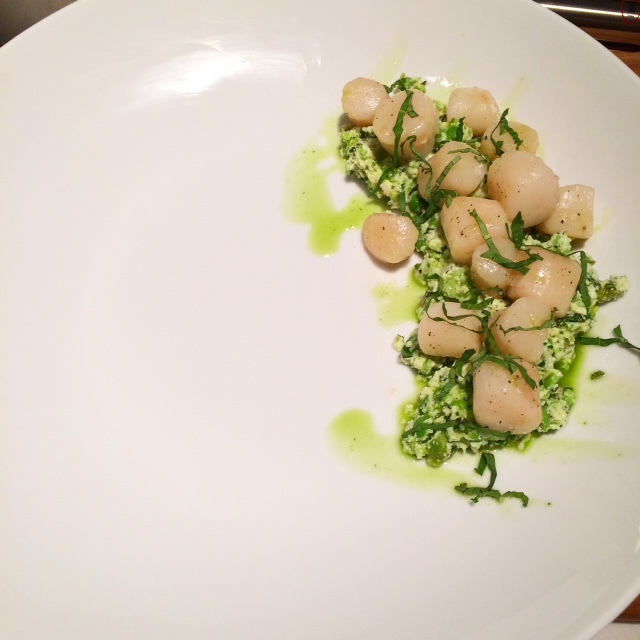 They actually looked better than my real scallops and I was proud of myself for being so clever. I had to use bay scallops because nobody had anything bigger, and they don’t sear up as good as larger ones, so I wasn’t able to get the browned caramelized color on them. But they tasted just fine. Where the heck have you guys been? I’ve been waiting to tell you all about the last few weeks of class but…oh….wait, it’s me that’s been absent, not you. Woops! Well, it’s been a heck of a few weeks, where do I start? We finally moved into some more “normal” types of food in this second half of the quarter. We covered risotto and making fresh pasta, both of which I love and am convinced that I will one day be a total expert on. We revisited our friends of the sea and worked with some flounder, clams and mussels. I had a difficult time with the mussels. As you can imagine, they’re still alive when they come in to the kitchen. You have to wash them off and clean up any beards and the fresh water from the sink basically suffocates them so their shells open up a little bit in an effort to breathe. I found this pretty hard to do. I have been dealing with chicken and beef and whole fish, but none of them were alive when they came into the kitchen. 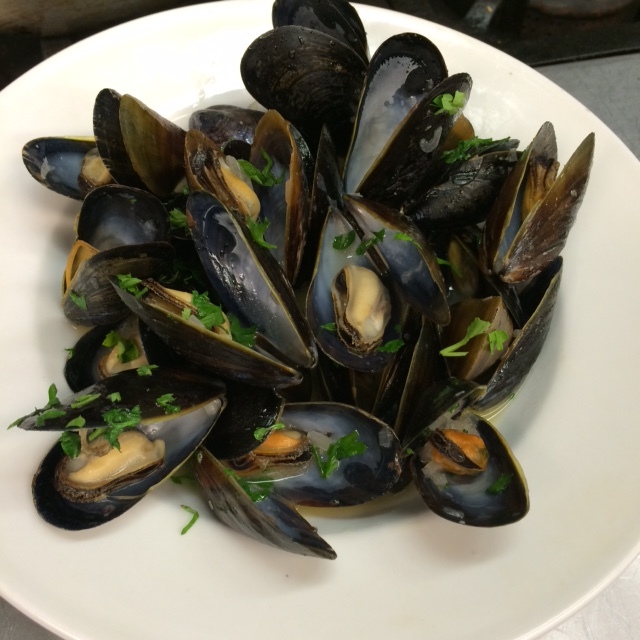 So needless to say, I did not enjoy making the mussels mariniere. The following week I made the most delicious beef stroganoff I can remember eating. I am enjoying my temporary hiatus from vegetarianism, but I don’t plan to be an omnivore full time once I’m done with this class. I am taking advantage of the situation because the likelihood of me recreating some of these meaty dishes for myself is quite low. Fresh ricotta – worth every minute (literally) that it takes to make! 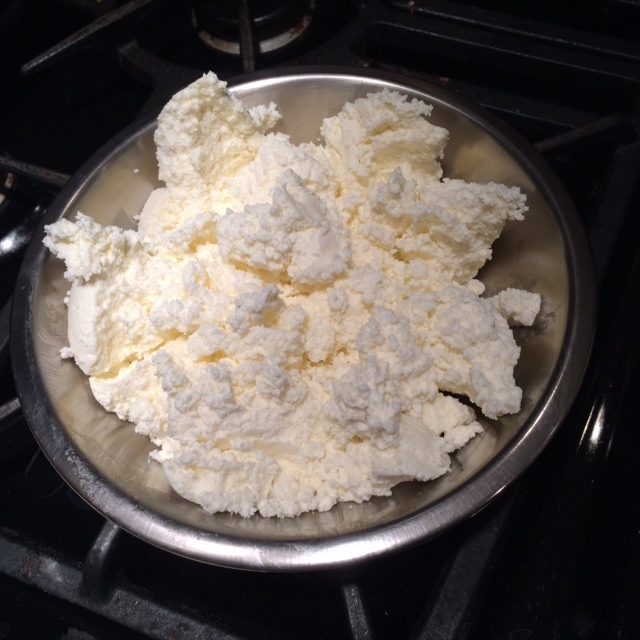 We also made ricotta and mozzarella cheese – easily two of my favorite things we’ve done so far this quarter. Ricotta is the easiest thing in the world to make and as my chef said, “learn how to make it and you’ll never buy it from the store again”. Truer words have never been spoken. I already made a second giant batch that I used in a pasta dish a couple weeks ago. It was heavenly! I also had my first total failure. I completely scorched my beef bourguignon – a dish that I had been looking forward to making and using my omnivore grace period to eat. I totally decimated it. I didn’t have enough liquid in my pan when I put it into the oven and I never checked up on in until an hour in, and by then the devastation was complete. Lesson learned: always check your oven and check your food 5-10 minutes in to make sure it’s not overcooking. It was a sad loss. I have only three more classes left this quarter, so there is still a bit of ground to cover, but I am looking forward to a break in the latter half of this month. This schedule combined with the awful winter is wearing on me and I am ready to kick back and relax a bit! The last couple of weeks of class have been the least exciting of the whole program so far. I’ve seen them as sort of the necessary evil one must go through in order to get to the more exciting part in the upcoming weeks. We’ve covered a lot of different topics, but nothing has really captured a ton of my interest. We spent one night on sandwiches and made a Rueben, Monte Cristo, club sandwich and a veggie wrap. It was an insane amount of food to make in one night. For just a bunch of sandwiches, there’s an incredible amount of work to do. I ate none of them save for one small piece of the Monte Cristo. I had never had one and at that moment, it just looked really good and I knew I’d never order something like that at a restaurant so I gave it a try. To my surprise (or, why should I be surprised that something deep fried wouldn’t be good), I found it to be pretty divine. An excellent choice for hangover food if one is in search of something of that ilk. Ladies and gentlemen, I give you my newest favorite dish! I knew I wanted to make risotto this weekend and I have been thinking about a dish I had at a restaurant recently that had a really good pomegranate sauce, so I built this dish based off those two components. 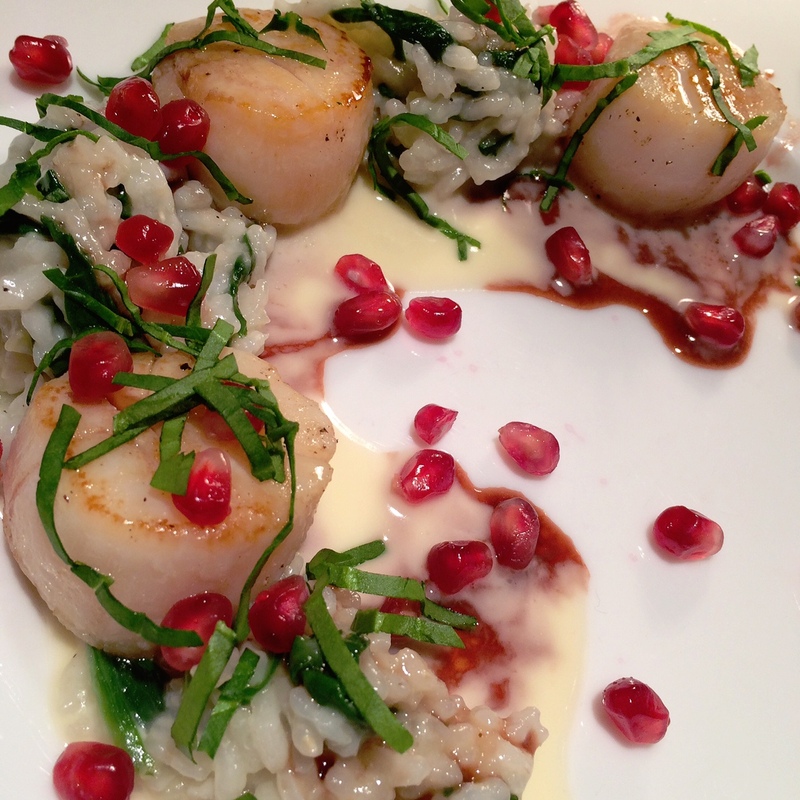 I also did an Instagram search for #risotto to look for plating inspiration. Since I’ve acquired all these new handy dandy skills from class, I figured I’d put them to work and make my own veggie stock to use. One of my issues with using store-bought stock is that some of them are too dark, and it turns the rice dark, which I don’t like and definitely didn’t want for this particular dish. So, since there was no suitable excuse not to, I started the day slicing, chopping and boiling down my own vegetable stock. I got exactly the color I wanted. I had a hodge-podge mix of almost-enough-for-dinner leftover ingredients around the house this weekend, so I decided to throw them on a pizza. 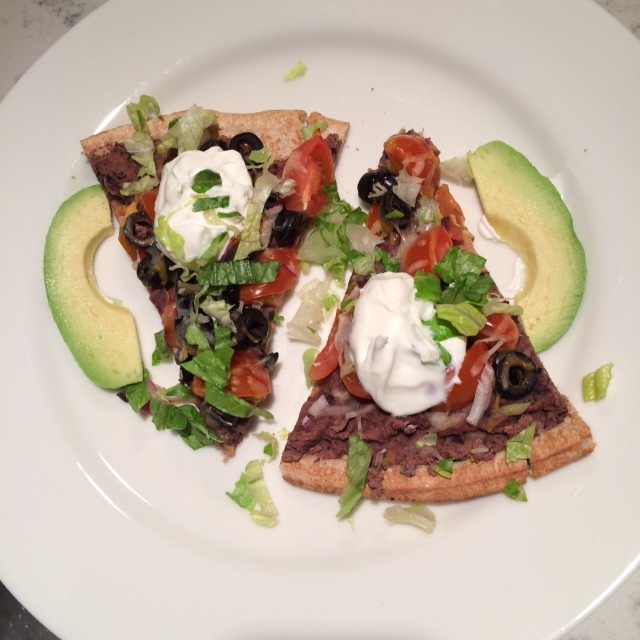 This also has enough good-for-you ingredients on it, so why don’t we just call it a healthy pizza, too?